Manga4life reviews "Sengoku Basara: Samurai Kings". This review is something I’ve wanted to do for quite a while now but I just never got around to doing it until now, I’m a bit upset at myself because of it because I feel this series deserved it’s own review on The Thought Corner and the time has finally come for it to be added. As for the series itself, it revolves around different factions that have been at war with each other but find they share a common enemy and and decide to team up against a dark lord named, Oda, who has unleashed his will upon the land. Before this takes place we get to see some pretty awesome action between the two main characters, Date Masamune and Yukimura, as they battle each other for supremacy, as well as an intense clash between their respective armies. So basically, if you enjoy intense action, a fun but simple story, awesome characters, and unlikely/likely team-up’s then you will probably really like Sengoku Basara. As the stoy progresses along you get to meet some fun characters, such as Oda’s sister, and leaders of other clans, who all have their hands in the plot, including a hilarious leader who is killed by Oda in a scene where you see exactly what the dark lord is all about. Like I had mentioned before, this series is based on a video game in Japan, so going into it I was a little iffy because I’ve seen animation based on video games in the past, and while some may have been fun, it usually turns out fairy "bleh". 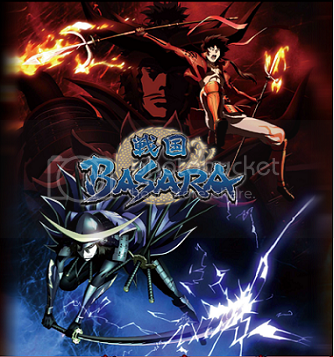 Luckily this series turned out to be a delight and the story was much more than just some all too familiar plot that bogs down many video games of today, it only took the first episode to prove to me that Basara was much more than just a cartoon adaption of a video game and that it had legs to stand up as a solid production. Now it's time to tackle the fun stuff, you know.....animation, sound effects, music, storyline, and the overall production value of Sengoku Basara as an anime series to see if it stacks up. First thing I'll cover will be the music and sound effects of the show, something I felt Basara kind of lacked when compared to other anime being produced today. The sound effects are your standard fare of swords clashing and horses dashing, so there wasn't really anything wrong with the show when it comes to that kind of stuff, my main complaint is the lack of a good soundtrack. Aside from the opening theme in Sengoki Basara there is a complete void of any truly likable tunes coming out of this show, seriously, almost nothing about the soundtrack is noteworthy at all. It struck me as kind of odd because with all the great action and intrigue you would figure that they would have cooked up an awesome OST to accompany these scenes, but instead we get fairly generic music that ranges from decent to utterly forgettable. Thankfully, the production crew made up for it with pretty awesome animation that really helped to make this series easy on the eyes. I really enjoyed the character designs and the flow of the artwork throughout this series and aside from a few snags toward the beginning of the show, I'd put this up against most of the high quality anime being produced today. This show really shined in top down camera angles that showcased a massive melee, a lot of shows tend to lose quality when featuring multiple characters on the screen at one time, but for the most part Sengoku Basara was able to keep everything nice and clean. Which made me very happy during huge brawl es and clan warfare. As I've mentioned previously in the review, the story and plot line is fairly basic but handled in a way that made the show extremely fun to watch, it doesn't stray too far from the core tale and the way the writers handled it made it very easy to follow. The way many of the characters were handled, Oda in particular, really helped to bring out their true essence and made them seem larger than life and important to the overall scope of the series. I know a lot of shows are good at doing this, but I find it important when handling certain types of characters, especially villains, and they handled Oda perfectly and it made me fall in love with the character to the point to where he's become one of my favorite villains in all of animation. He's a true badass, probably one of the coolest badasses in all of animation (in my opinion). All of these things help to make the series fun to watch, which is the most important thing when sitting down to watch a series that you've yet to see yet. Sengoku Basara is 13 episodes, so it's short, but in it's 13 episodes there is a lot of fun to be had and I'd say that if anime with massive fight scenes is up your alley that you could easily finish this series over the course of a day off or two. The whole thing just flows nicely, episodes fly by very quickly, and the whole thing felt like it was over in a snap, that's the mark of a good anime series, if you ask me. I invite those who've read this review to check it out for themselves and get back to me on Twitter, or one of the many forums I frequent on the web, to let me know what you thought of it, I'm guessing that if you give the show a try you may just come out happy that you did.